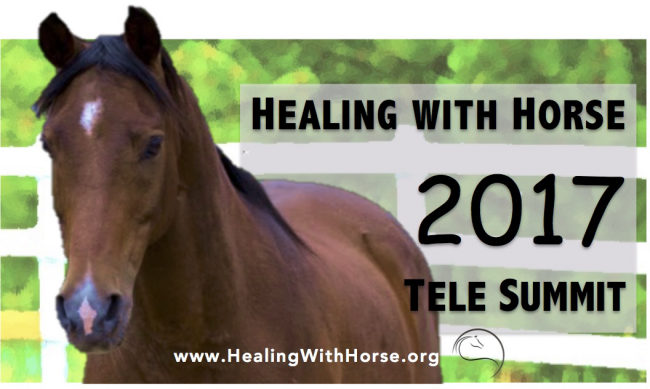 Alright my fellow Horse Listeners, if you have not yet signed up for your FREE access to this year’s Healing With Horse Tele Summit, I strongly encourage you to do so as the line-up of talks is really juicy. Right near the beginning, like on Day 4, is our own Kesia Nagata. Those of you who have been following her Rewilding Journey here on the blog, will be able hear the in-depth details of that process, plus her thoughts, questions and hopes for the future on that call. And yes, all these juicy calls are FREE for 24 hours after each one is released. At the end of the Summit I believe you’ll be given the option to purchase the recordings (download the mp3 files to your own computer or device) if you wish. Here’s the link to a more detailed description of each presenter and their topic, and the sign-up box to register for free is on this page too. As you can see, I’m on there for Day 8 – if you’re an equine therapist, or other client-based practice, or you have an active blog, then join us for sure! I’m going to lead you through a powerful visualization exercise that will allow you to connect with your ideal client/customer/follower in a very authentic, enlightening way. Along with a bunch of other tools and tweaks to take your business or organization to the next level. Personally, there are a number of talks I’m feeling particularly drawn to – I can’t think of a better playlist for when I’m driving around than immersing myself in this smorgasbord! Girlfriend, you need a STASH of chocolate a little closer to home. I suggest an emergency stash in a box out in the barn or chicken or goat pen! Lady, don’t think for a SECOND a stash of any size would make it through the night in my household of overeaters not-so-anonymous!! Thank you Jini and Kesia for posting about the Tele Summit! I sincerely hope these talks raise topics for further exploration and conversation, as well as provide invitations for ways to practice horse-guided healing work and to care for our horses. It’s been a labor of love to bring these talks together. Thank you all for listening in and joining the conversations!